Two major labs in the country are at work on a vaccine against the epidemic that threatens to spread outside western Africa. A few days ago, I returned to Moscow from Malaysia via Abu Dhabi. My Etihad Airways flight landed at Domodedovo Airport, and before the passengers were allowed to leave the airplane, two employees from Rospotrebnadzor, the authority responsible for monitoring the epidemiological environment in Russia, walked through with infrared thermometers to take the temperature of each passenger. Their goal, and the goal of their colleagues who have been inspecting all international flights into Russia since September, is to detect Ebola. Russia does not have any direct flights from the West African countries considered to be the main sources of the epidemic: Liberia, Guinea and Sierra Leone. However, the authorities believe they can’t be too careful in preventing an outbreak of this disease. Right now, the main problem facing the sanitary authorities is that the incubation period for Ebola can last up to three weeks. This means that when they are crossing the border, people infected with Ebola may appear completely healthy and show no symptoms, which in any case are partially reminiscent of malaria – strong headaches, weakness, diarrhea, fever, muscle and abdominal pain and vomiting. According to Rospotrebnadzor chief Anna Popova, there have been about 20 cases of the virus have been suspected in Russia since the beginning of the year, but none of them have been confirmed. Since then, approximately 600 people traveling from West Africa have been put under the supervision of a doctor, but now almost all of them have been cleared. Mikhail Shchelkanov, an Ebola expert and head of the Laboratory of Virus Ecology at the Ivanovsky Virology Institute said that Russian authorities were prepared to cope with the virus. “The population does not even suspect that [the country] has a bacteriological security system making it possible to detect and isolate more than 200 cases of exotic viruses penetrating the country each year,” Shchelkanov said. Nevertheless, ordinary people are afraid. According to a poll by one of Russia’s leading public opinion research centers, the Public Opinion Foundation, 47 percent of Russians think there is a risk of Ebola spreading into Russia, while 60 percent believe the government needs to beef up measures to combat the virus. Of the latter, 18 percent suggest strengthening sanitary control for people traveling to Russia, 10 percent think Ebola needs to be researched and a vaccine needs to be developed and 9 percent think entry into Russia should be restricted for people coming from Ebola epicenters. According to official reports, all of this and more is already being done. These reports state that Russia has allocated $19 million to the fight against Ebola and redoubled efforts to create a vaccine. In addition, a Russian epidemic control team has been at work on the ground in Guinea since August. The team is using Russian test systems that have been confirmed as effective by the World Health Organization (WHO), and it is helping local doctors diagnose and treat Ebola. The team has a mobile laboratory based on a Kamaz truck. According to Popova, Russia will also send extra epidemiologist brigades to West Africa. The Virological Center of the Defense Ministry’s Microbiology Research Institute in Sergiev Posad and the Vector State Scientific Center of Virology and Bacteriology are working on an Ebola vaccine. 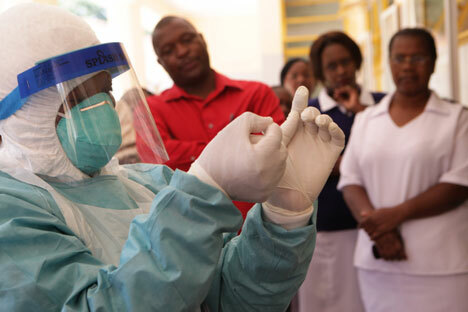 Both institutions started working on Ebola - including creating biological weapons on its basis - during Soviet times. Their work is still classified, although scientists who work there sometimes disclose information. For example, in mid-October Vector’s Deputy Director Alexander Agafonov said the center had managed “to construct several vaccines against Ebola” and that it was preparing for preclinical trials. The vaccines have already been tested on guinea pigs and monkeys, and one of the vaccines was effective. Scientists have not revealed any details about how the vaccines were created or when they can start being used. A query about the vaccine sent by RIR to Rospotrebnadzor, which is the parent organization of Vector, in September went unanswered. Chepurnov started working with Ebola at the end of the 1980s. His laboratory also researched other deadly viruses, including Lassa, Machupo, and Marburg. In 1996, the laboratory discovered the “genetic basis of the virulence” of Ebola. “Usually the virus infects only humans and primates. We introduced the virus into guinea pigs, some animals with certain manifestations of the disease were selected, the virus was isolated from their tissue, and we injected it into the next ones. This is how we derived a strain of the virus that could kill guinea pigs. If we compare its genome with the genome of the wild strain, we can find the genetic factors of virulence,” Chepurnov explained. Within four years, Vector had identified the mutation of the virus that is responsible for virulence. However, the research was not conducted without tragedy. In 2004, Vector lab techician Antonina Presnyakova died after being pricked by the contaminated needle of an infected syringe. Although the military research institute in Sergiev Posad had developed an antibody to Ebola in 1995 that can help patients who already have the illness, it did not save Presnyakova. Chepernov said that this was likely because she had already been infected with the disease twice before and may have developed immunity to the immunoglobulin. “Such vaccines have been made abroad, but with the help of our scientists, who are former employees of Vector. Victor Volchkov, who now works at the University of Lyon, supplied several components to make a prototype of the vaccine on the basis of the vesicular stomatitis virus. Alexander Bukreev, who now works at the Galveston National Laboratory in the United States, did an entire prototype of the vaccine based on the parainfluenza virus,” Chepurnov said. According to WHO data, Ebola had killed approximately 4,600 people by mid-October. But there is also good news: on Oct. 20 it was announced that the virus had been stopped in Nigeria. It has already been eliminated in Senegal.